“A Sense of Place” is the Healdsburg Museum’s first juried art exhibition, co-curated by Holly Hoods, Vesna Breznikar and Dana Hawley. 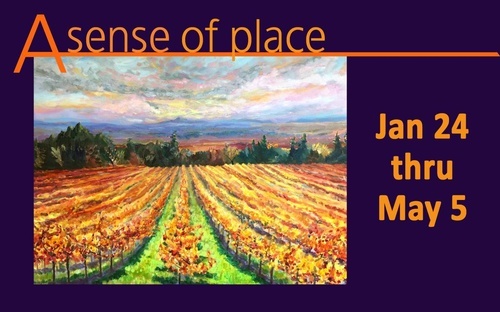 Created by local artists, the art on display evokes a sense of place, reflecting the vibrant colors, geography and storied landscape of northern Sonoma County. Recognizing history as a continuum--not as a distant bygone era, the art of the past and present is exhibited side by side. The artistic media represented in this exhibition includes oil paint, pastels, acrylic, watercolors, etching, pen and ink, lino print, mixed media sculpture, weaving and photography. The artwork dates from 1865 to the present, yet it is in the best sense timeless, grounded in this place. Recognizable landforms such as Fitch Mountain are depicted besides hillside vineyards, vintage buildings, valley oaks, Russian River and Mill Creek redwoods. Pomo baskets from the early 20th century showcase remarkable Native American artistry. Notable artists from the past include L.P. Latimer, Grace Hudson, Maury Lapp, Rosinda Holmes, William Monmonier, S.H. Shakespeare, Alice Haigh Dixon, Lou Galeazzi, Jane Raabe, Myra Hazen, Ollie Gaddini Bacigalupi and Maude Needham Latimer. Downstairs, our first floor gallery highlights the talents and camera equipment of young Mervyn Silberstein, professional photographer of early 1900s Healdsburg. The artists of today include Tania Amochaev, Linda Barretta, Beverly Bird, Kathy Birdsong, Vesna Breznikar, Shonnie Brown, Donna DeLaBriandais, Dana Hawley, Linda Kammer, Ed Liu, Barbara Médaille, Karen A. Miller, Peter Nevins, Sharon Pillsbury, Joyce Power, Mary Ruffato, Terry Sauvé, Donna Schaffer, Richard Sheppard, Joanne Taeuffer, James Thomas, Phyllis Calvin Thomas. The exhibition features many items on loan from private collections, as well as rarely-shown selections from the Healdsburg Museum’s collection. Don’t miss it! Funded by a 2018 Healdsburg Tourism Improvement District grant and the generous support of Healdsburg Museum Business Partners: Summit State Bank, Brush Bernard CPAs, Big John’s Market.